Failure sometimes can be healthy for the soul, but it is always good for your tech. Disambiguation Note- CoopIP is being renamed FairIP, where any AWE conceptual creator working outside the broken patent system can claim a moral right to compensation on an "honor system" basis. It is anticipated that socially responsible companies will honor & even create FairIP, if costs are kept low overall & lower than competitive patented IP. CoopIP is henceforth defined as pooled FairIP & patents, copyrights, etc. along cooperative principles. Single-loop through two ground pulleys. Gear at lofted spinning kite-lofted wing drives the loop; the driven loop rotates ground-station generator or pump. The main tether could be a double-line (two parts of tensed loop). "run a continuous loop of line from a capstan on the turbine to one on the ground gen" DaveS concerning alternative to torsion tube driving ground-based generator as he was weighing how torsion tube method limits system to low altitude winds. Contrast stay-aloft-spinning driver systems from the method where kites go up and go down in a loop; both have a driven loop, but the wings-stay-aloft method is quite distinct from the wings rotate up and down via changes of angle of attach of the wings. fancy concepts for AWECS "My point is: forget fancy concepts. Go with something easy and relatively inexpensive to build, deploy and control." FAP R or FAPR Footprint-and-Airspace-to-Power Ratio. AWECSs use land and airspace resources to generate power. The efficiency of system is studied in several ways. Costs for an AWECS involve other parameters beyond land and airspace. FAP Ratio- as in "Monotether flygens have a low FAP number." First use. Study: Payne, Santos, Gaylord Olson, Goldstein, Selsam, Benhaïem, and others. fence generator FenceGenerator FenceGen Specially made fences that waft in winds to generate electricity or pumping at the base. These may also be surfaced to use PV. FF-AWE Free-flight AWECS Double-kite dynamic soaring with optional mining for extra energy production. http://www.mabonideas.com/aeroplane.html has a two-kite free-flight aerokite dynamic soaring sketch [[FF-AWE]] See: Richard Miller, Dale C. Kramer, Wayne German, Dave Santos, Joe Faust, Mårten Bondestam, etc. FF-AWE involves a focus on the type of paraglider recorded in 1896 by Gilbert T. Woglom, further describe in Without Visible Means of Support by Richard Miller in 1967. Fiberology - the forming of fibers and characterization of their behavior - and Fabric Geometry - the design of highly efficient flexible structures from yarn bundles and their characterization. fishing for kites (game of catching kites by a fishing pole). Flair Mk4 Kite is not a mechanical kite, but an untethered powered aircraft. flap turbine VAWT that flags its upwind vanes while the downwind vanes capture the ambient wind. Drag-based. High angle of attack change is thus effected for the upwind movement. Check valving. One test. flaps and slats and effects on CL, etc. The landing flare of birds and hang gliders. Discussion of flaring in hang gliding: HERE. 1. To flame up with a bright, wavering light. 2. To burst into intense, sudden flame. a. To erupt or intensify suddenly: Tempers flared at the meeting. His allergies flared up. b. To become suddenly angry. Used with up: He flared up when she alluded to his financial difficulties. c. To make a sudden angry verbal attack. Used with out: flared out at his accusers. 4. To expand or open outward in shape: a skirt that flares from the waist; nostrils that flared with anger. 1. To cause to flame up. 2. To signal with a blaze of light. 2. A device that produces a bright light for signaling, illumination, or identification. 3. An outbreak, as of emotion or activity. 4. An expanding or opening outward. 5. An unwanted reflection within an optical system or the resultant fogging of the image. a. Football A short pass to a back running toward the sideline. b. Baseball A fly ball hit a short distance into the outfield. 8. Medicine An area of redness on the skin surrounding the primary site of infection or irritation. flaws of the wind Early expression regarding gusts. flechette fléchettes wiki Peaceful uses? Consider clearing mines, tree planting, grabbing goods, ??? flies noun, for a gathering of people to fly kites. flight feathers remiges (singular: remex) wiki wing flight feathers. The tail flight feathers: rectrices (singular rectrix) Bird wing structure. flike fly+hike=flike Term first used in early hang glider magazine Low & Slow for the activity of flying, hiking, flying, etc. for long travel experiences. Beyond XC. flip-flop hub See also double-sided hub. wiki Study. Note2: This is great news! A bicycle wheel can be filled with concrete between the spokes. A circular, donut plywood "floor", for the bottom side of the wheel, is made. Then filled with concrete. An integral airfoil that has rapid change of angle of attack so as to cause a rotation about a axis is flipping and thus a flip wing; the rotation may be full and continuing or may be partial and reversing. Do not confuse Savonius or Darrieus arrangements as flipwing as they are composites of two or more airfoils with special interactions because of the multiplicity. Flipwing Ghost, product, available January 2013: The Flipwing Ghost itself or with a ready-to-fly kit. "Customer can pick colors and work application." floating sail (sometimes used to mean "kite"). Also, the phrase is sometimes used to refer to an LTA kite. Could this have application in marking wind at hang glider launches? Kite systems involving towed hulls or paravane will need to handle flotsam. flow meter 1Ref And think: flow converted to signal ... Many types give clues to kite-energy concerns. The motor or engine is an assist to obtain soaring or gliding altitude. One vision has an x-FLPHG launch from flatland; then upon reaching altitude, the system drops a tether to be connected with a second glider to form a two-kite system that mines wind strata differentials for FF-AWE for travel and some additional energy mining from upper winds' kinetic energy either horizontal, gust, or thermic. Note: Regenerative soaring tactics are included through the "kitricity" door. Mostly in aviation "flutter" is a bad thing; the same is true in much of AWECS, but not all; there are some strong special interests in mining flutter for energy from winds. Flutter mining. Shawn Frayne is the inventor of the Wind Belt. FLWAHJ flatland wing-assisted high jumping Note. Solar-powered flight "first" ??? First at what? With or without storage of the sun's energy onboard? Etc. Inhabited or not? Pre-charged battery or not? Battery or not? Human-powered-assist or not? AstroFlight Sunrise Maiden: 4 November 1974 See. Uninhabited. Solaris by Fred Militky, Uninhabited. 16th of August 1976. Solar One - Solar powered airplane - Race to the Sun 46 min Battery assist. True maiden flight on December 19 of 1978 in morning, cold, ice on wing, pilot David Williams and observer Derek Piggott Inhabited by the pilot at Lasham Airfield, Hampshire. Maiden "press" flight: 13 June 1979 with pilot Ken Stewart. Solar Riser Maiden: 29 April 1979. Larry Maurro, member of Self-Soar Association, at time the Solar Riser, a solar version of his Easy Riser hang glider, at Flabob Airport, California. Gossamer Penguin, May 18, 1980. Solar Challenger Maiden: 6 November 1980 MacCready No battery. Sunseeker | summer of 1990, the solar powered airplane Sunseeker, piloted by Eric Raymond. "Fly-Off" is the competitive variant. flyers Also found: fliers Sometimes used to designate pilots who fly aircraft. AWES that generate electricity by having a driven generator lofted is a flygen. flying electric generators (FEGs) are flygens. Minesto has flygen in the media water, not air. The paravane (water kite) sends generated electricity down its tether. 1908 Popular Mechanics, May issue. Nemethy's effort from study of paper dart, 1907 notice in American Inventor. 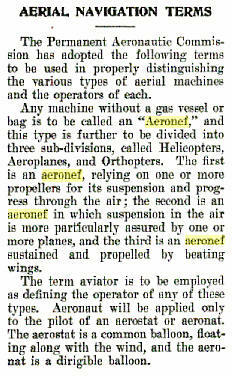 http://www.mfa.gov.hu/NR/rdonlyres/AF6AFA4A-2621-4D57-BB2D-5AE4AC561FDA/0/GREAT211.pdf speaks of his equation and aileron designing. The Flying Plaza may be a secretive black box, without even basic target specs made public. Pumping during calm is being carefully considered for kite-raised architecture. See KiteTrains where well-spaced wings on a tether result in a global "rope" that is well lifting along the length; stand back visually and let the image of wings blur into a macro image of "rope." A separate lifter kite is not needed beyond what appears from a distance as fat rope flying. Just how tiny might the segment wings be in a kite train to effect a "flying rope" status for the macro structure? A continuous line or rope hung from of a kited wing will have positive lift and positive drag as the wind impacts the windward surface of the rope. Many streaming tails of kite systems are essentially lifting flying ropes of particular shape. Sometimes activities such as zip-line riding is called "flying rope"
Flying Wedge ... "notorious non-flier". But later some success by someone. [[Explore for arch kite segment]] A version: Charlie Sotich and his Collapsible Flying Wedge, 1989 Smithsonian Kite Festival, Washington, D.C.
flyoff, AWES Flyoff :: Competition between makers of AWES to determine AWES method superiority. Wanted: Attractive prize, perhaps modeled after the Kremer prize for HPA. Wayne German has proposed simulation flyoff for kite energy systems. In the coming years of 2014 forward, some forms of AWES flyoffs are being anticipated. flywheel Also consider eccentric flywheel mass (M2862). Consider tunable eccentric flywheel. foam for kite wings and AWECS and kite motors. EPP and EPS: distinguish. FOF! Flights of Fancy! ~Wayne German, 2003, trial name for tethered free-flight systems, et al. Foildesign is a group. Request free membership. forecasting, AWE forecasting, airborne wind energy forecasting. FPGA field-programmable gate array wiki The integrated circuit is being programmed by some AWECS teams. Note: A kite (wing, tether, resistive set) has a tether set that does not really have any "free end" as the resistive set occupies the lower end of the tethers; that occupation makes the "end" not free. free fall and efforts to distinguish the use of the term in distinct circumstances: wiki That is, "free fall " does not mean the same thing in some distinct scenes. Confusions may result when parties are analyzing matters without the same definitions for terms used in conversation. Free-flight AWE, Free-flight AWECS, FF-AWE, FFAWE, Methods and applications vary for FF-AWE. RATs as auxiliaries on powered and unpowered untethered or tethered aircraft are a subset of FF-AWE with tethered and untethered versions. Also, there is the category of FF-AWE that is fully unpowered with a tether system terminated with lifting bodies set and controlled in different wind environments. FF-AWE may be purposed for soaring transportation or for energy production or combinations thereof. Free-Flight is the term used for sustained flight by multiple tethered-foils opposed across a wind gradient. The Planetary Boundary Layer is the most common gradient. Small scale kites have already sustained flight downwind, but tethered-foils can in principle fly in any direction faster than the wind. Soaring champion Dale C. Kramer proposes to pilot the first manned free-flight test, which would consist of his high-performance sailplane tethered over several thousand feet to a large soft-kite. While Dale can get clearance for a demonstration, popularization of this flight mode in the NAS will require NextGen flight trajectory and moving-constrained-airspace control. ~~DaveS, December 2010. "FreeFlight" is a term used to describe "Tethered Airfoils" (two (or more) wings tethered together) sustaining flight by working across wind-shear. A hapa is closely similar in operation, but with one "wing" in a water medium. or a free-flight component and transition smoothly between modes. or operate in freeflight with the paravane carried along. -A "payload wing" operating by surface effect, and the other kite wing far up in good wind. -Pairs of Sailrocket-like platforms flying in alternation, or taking off together for extended flights. suggests it be called a "Prig". One is flying without having to respect defined flight tasks. Free On-line Dictionary of Computing (FOLDOC). Free Rotor by just as 'Colin Bruce Jack' 1992 patent under PCT at WIPO. Aerial mill and tidemill. Clip from that PDF: "Frederick To, AMRAeS was born in Hong Kong in 1938, came to the UK in 1952 to study, and qualified as an architect. He joined the RAeS in the early 70s, his main interest then was man-powered flight. In 1974 he made a documentary film on the subject called "The Last Challenge". He started building Solar One with the help and advice of David Williams in 1977. The next year Solar One made its first short hop at Lasham and it is believed it then became the world's first solar powered aircraft. By the middle of 1978 Fred To was making structural tests on the use of polyester film structures for an inflatable wing. He designed and built 'Phoenix,' the success of which is illustrated in this paper. He also tried unsuccessfully to produce an inflatable microlight, a project which was hampered in mid-life by the introduction of CAA regulations. In 1980 he formed his own company, The Air-Plane Co to undertake inflatable aircraft powered by a 22 hp engine. He still practises as an architect." Frigate™ :: bird-like plane, glider, powered aircraft, ... by Frigate (AC) Ltd.
F. R. Met. Soc. [ Fellow, Royal Meteorological Society ]. FSDO A Flight Standards District Office, or FSDO, is a regional office of the United States Federal Aviation Administration. There are about 82 such regional offices nationwide. FTHI failure to hook in HG example. In kiting, failure to give resistive component to a tethered vehicle or wing. FW, FWs flip wing, flip-wing, flip winging Group discussion.